W3 is Acton and Acton is the place in London with the most railway stations bearing one place’s name. There are seven. They cover all the points of the compass plus Central, Town and Main Line. The curious thing about this is that even though there are 7 stations with the name Acton, none of them is particularly convenient for the town centre, even the so-called Central Station! We start our walk at Acton’s main Post Office which is in King Street a short pedestrianised road by the Parish Church. 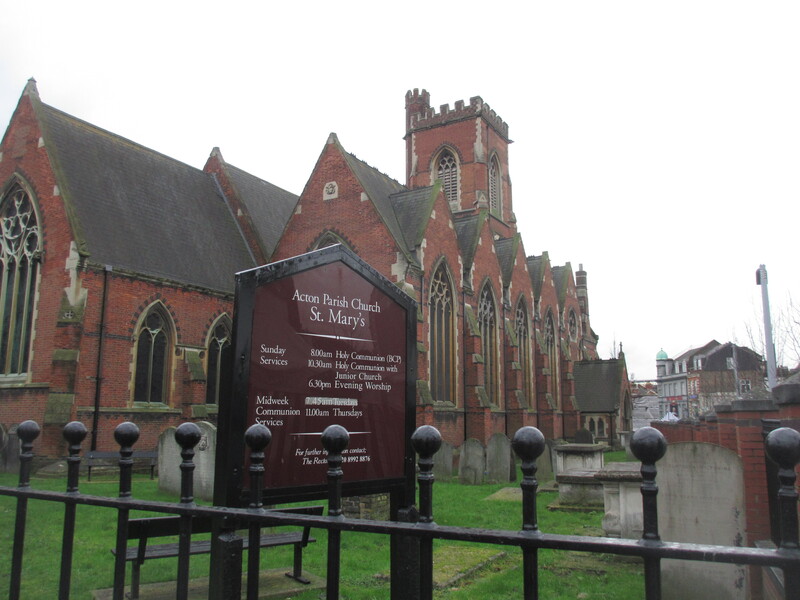 Our first stop, St Mary’s Church, is across the road from the Post Office. The Church dates back to at least 1228 but the building we see today results from a complete rebuild in the mid 1860s. Some monuments were preserved from the old church but I did not get to see them as the church has been closed when I have been there. However there are a couple of interesting things to see at the west end of the Church. First at the left had corner is the old parish pump. 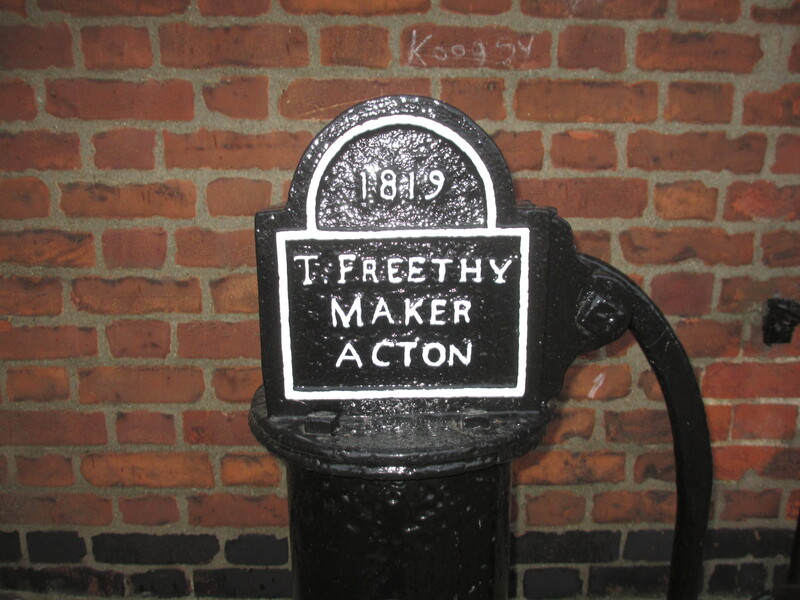 The pump is inscribed “1819 T. FREETHY, MAKER, ACTON, ERECTED BY THE REV WM. ANTROBUS”. It was originally located in the High Street but was moved when the High Street was set back in 1919. In 1952, it was taken to Gunnersbury Park and stored. The Acton History Group website suggests it was restored and resisted here in 1992. 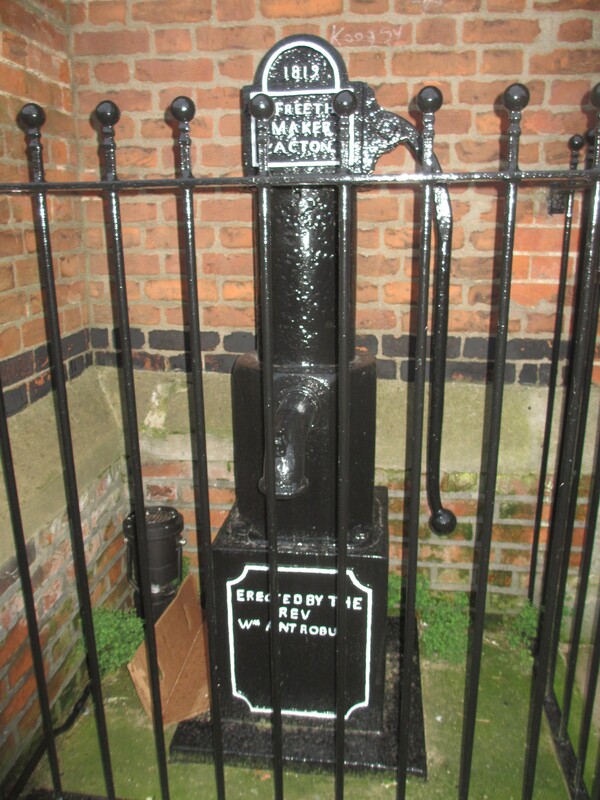 Just to the right of the pump is the Acton Milepost. 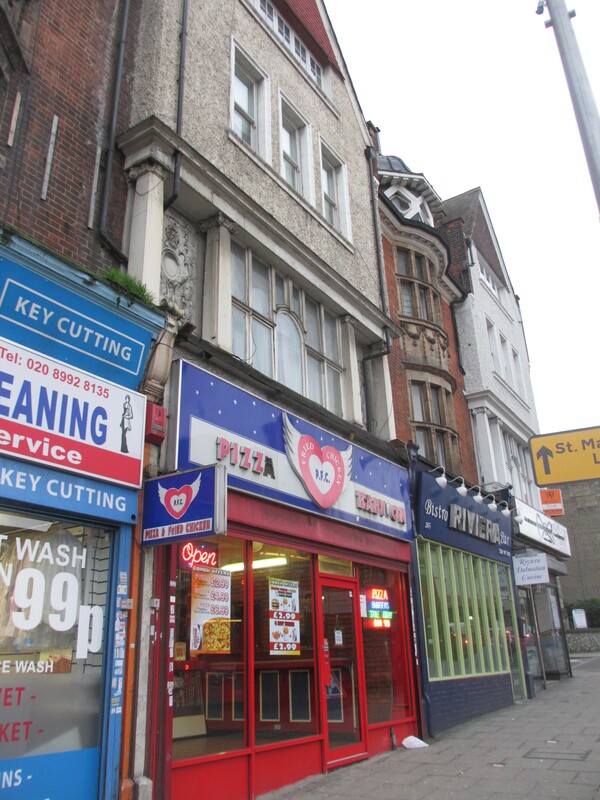 It was originally located on the opposite side of the High Street, a little further to the west of its current location. It was saved during road widening, and relocated here when the Pump was restored. 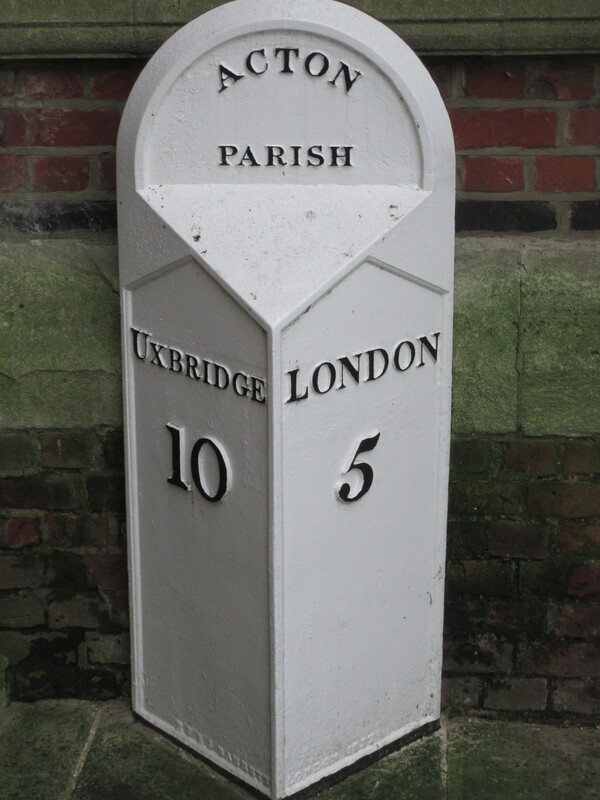 The road was known as the “Uxbridge Road” and it was a turnpike or a toll road with the money going to pay for maintenance. 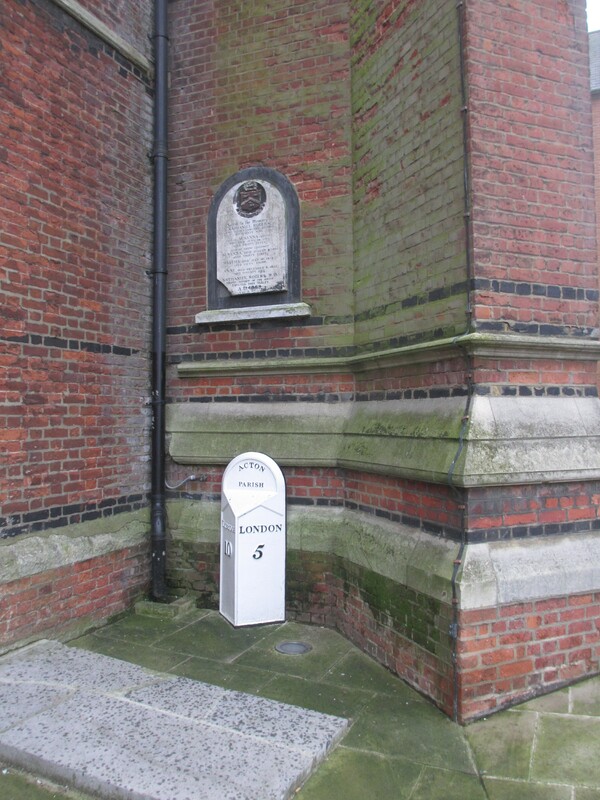 The distances on the post were measured from Tyburn (Marble Arch) which we saw in our W2 walk. There was a tollgate at the 4 mile post, about where now Bromyard Avenue joins the Uxbridge Road, which as it happens is where we finish our walk. 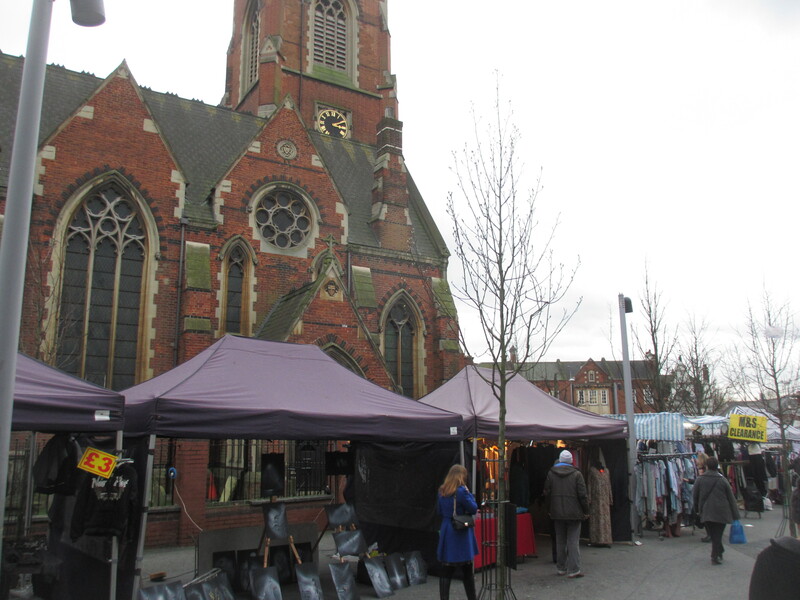 In the street by the church is a little market area – from a quick glance, it looked a bit cheap and tacky, like much of modern day Acton. Just over from the West Door of the Church is an entrance to Morrison’s Supermarket, which at least was bright, clean and tidy. This site, where King Street joins the High Street, once housed a cinema built for Oscar Deutsch who ran the Odeon chain. Opened in November 1937, it was a large Art Deco style building with those distinctive cream faiance tiles and featured a tower at the side. The Odeon was the last cinema to operate in Acton, finally closing in October 1975. The building was converted into a B & Q store. When that closed, the building was demolished and in 1988 a Safeway Supermarket was built on the site. 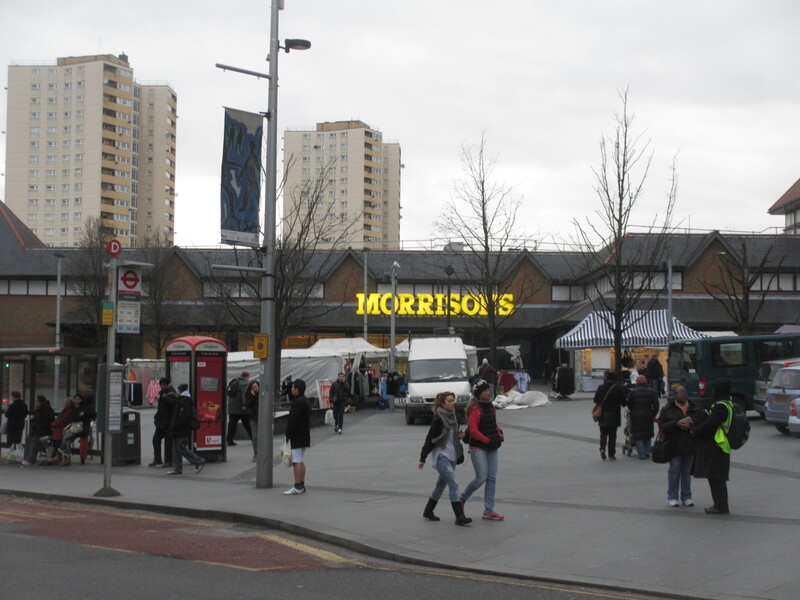 This later became Morrison’s. There are some photos of how it looked on the attached link. It is a bit sad to see the loss of such a distinctive building from the street scene to be replaced by this identikit supermarket. Fascinating fact: there’s a mnemonic (or is it an acronym?) for ODEON. Apparently Odeon at one time claimed that the name of the cinemas was derived from Deutsch’s motto, “Oscar Deutsch Entertains Our Nation”. However Odeon had been used for cinemas in France and Italy in the 1920s. Also the name “Nickelodeon” dates from 1905 and was widely used to describe small cinemas in the United States in the early days of cinema. And of course the word is ultimately derived from Ancient Greek. So who knows! Now walk down to the High Street and turn right following the road round. 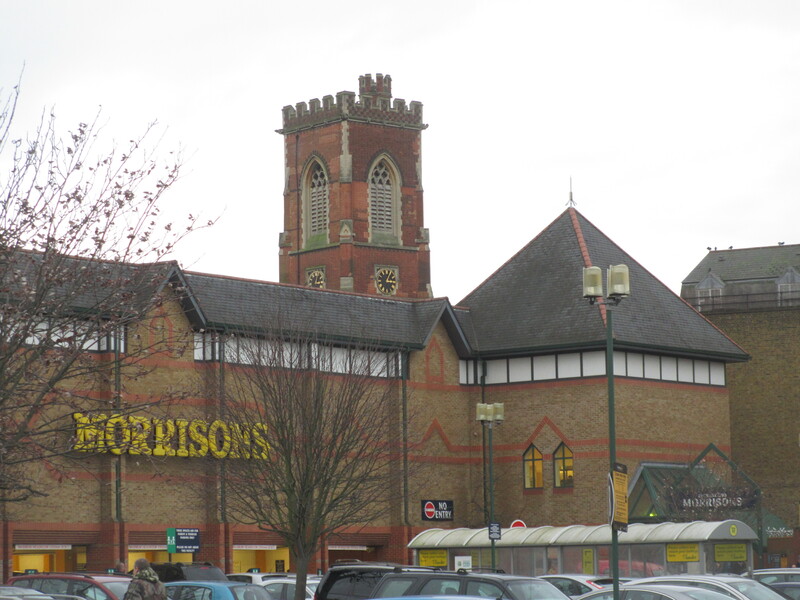 You will see Morrison’s across their car park, with St Mary’s Church sticking up behind. This is sad enough but across the road on the other side of the roundabout is perhaps even a bit more depressing. And here in this parade of shops, we will find our next stop. This Edwardian row of shops is rather grand but as so often happens, the locale is not now and the shops in these buildings reflect this. Cross over and go to number 263. 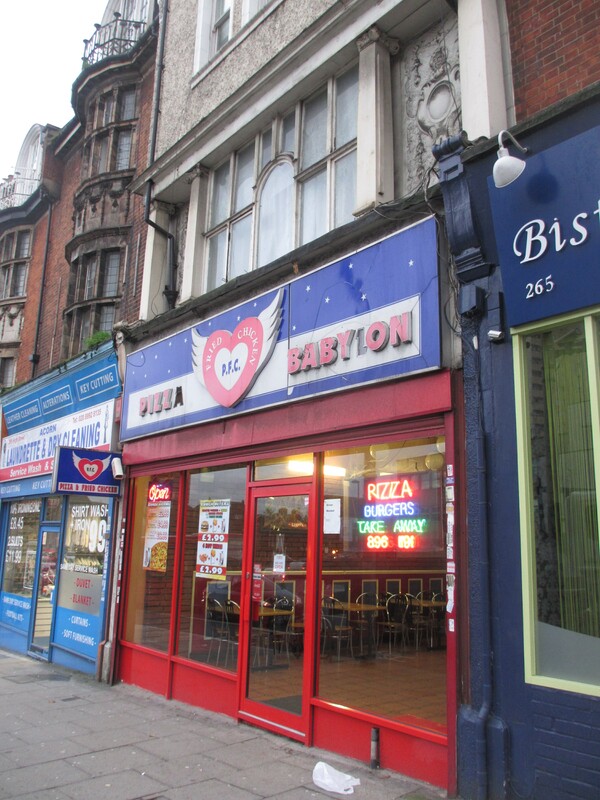 Today it is a fast food establishment called “Pizza Babylon” but this was the site of the very first Waitrose store in 1904, although it was called Waite, Rose and Taylor then. You will find a little plaque in the pavement to commemorate this fact. 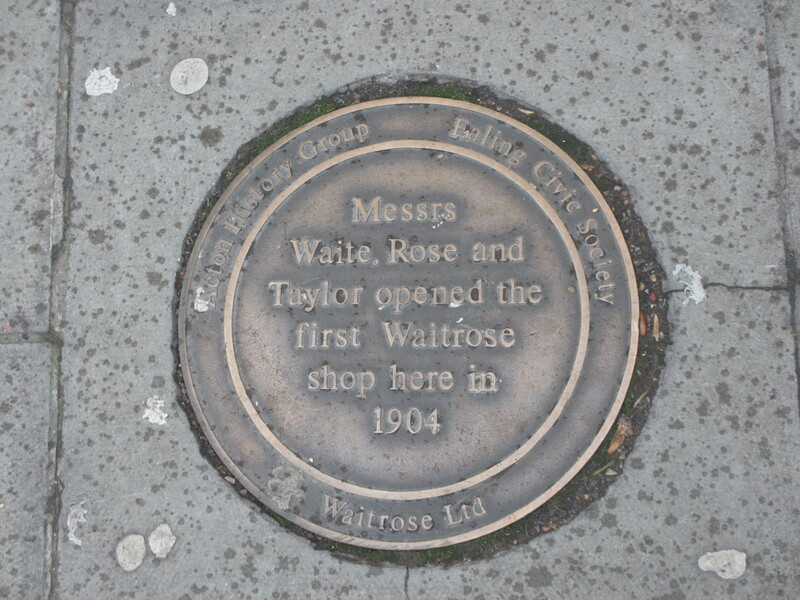 The company name changed to Waitrose in 1908 and the business was bought by John Lewis in 1937. I cannot seem to find out when this Waitrose closed but I guess it was when they, like all the other grocers, moved away from these small shops and into bigger premises that could house supermarket sized stores. Odd to reflect that the food being served up here today is rather far removed from the image one associates with Waitrose! And I somehow doubt there will be a Waitrose anytime soon in this locality. Keep walking along the High Street and after the church turn left into Gunnersbury Lane. It is now a bit of a walk to our next stop, which is just after a mini roundabout down a little private road on the right, called Museum Way. On the way, we pass an old hospital building. 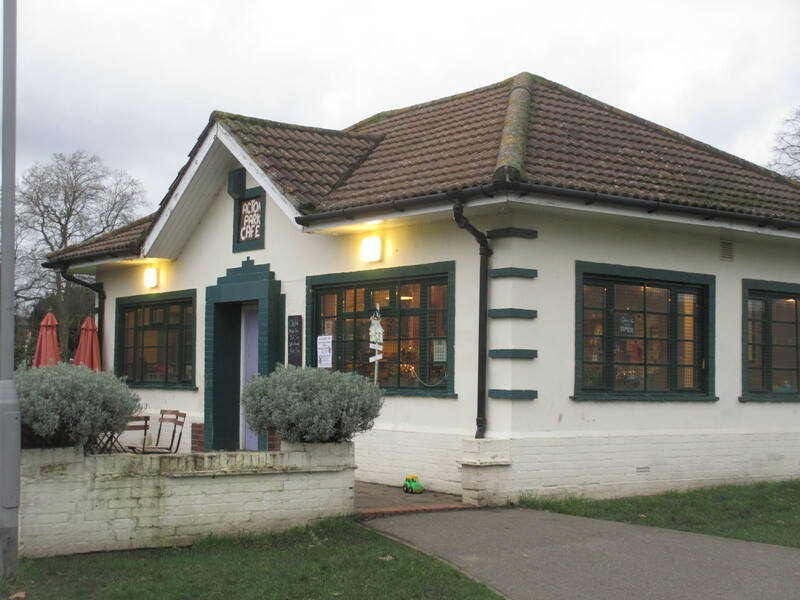 This was built as the Passmore Edwards Cottage Hospital around 1900. More of Passmore Edwards shortly. 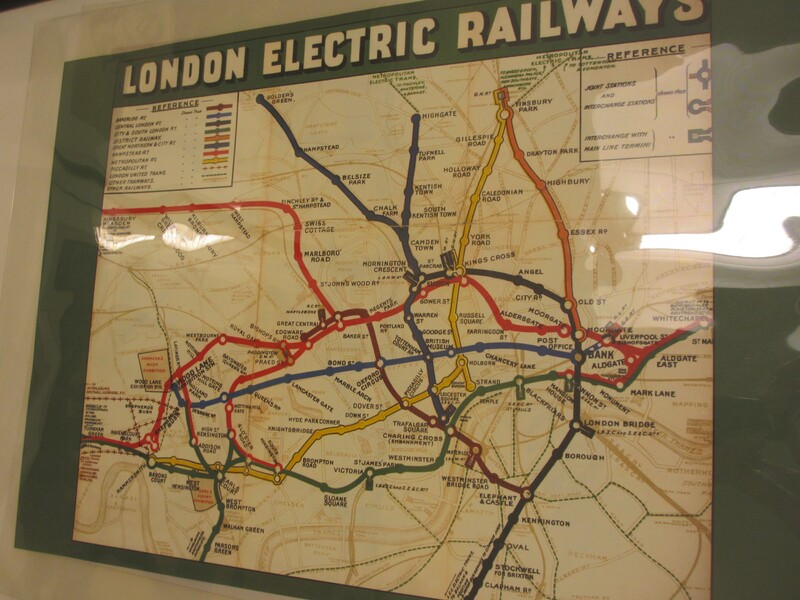 We cannot come to Acton without acknowledging the importance of London Transport to this area. 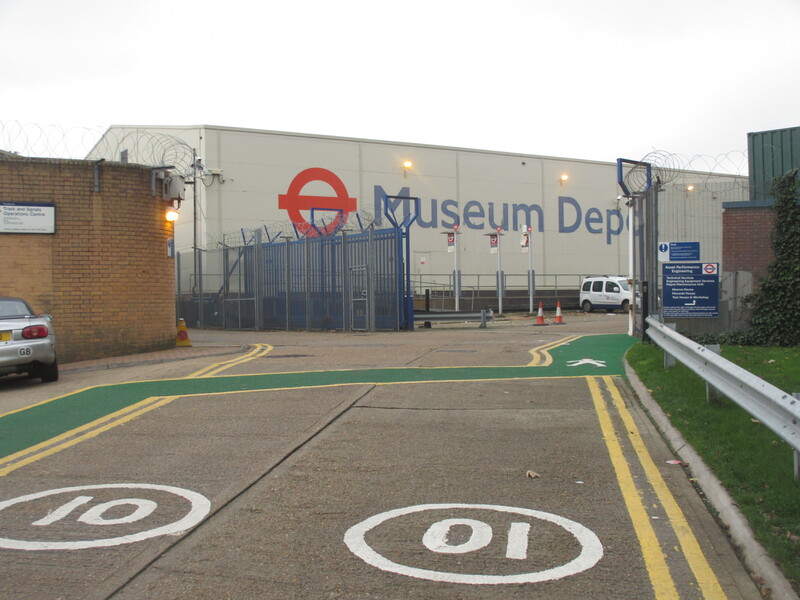 There is a huge depot here and on part of the site is the store for the London Transport Museum. 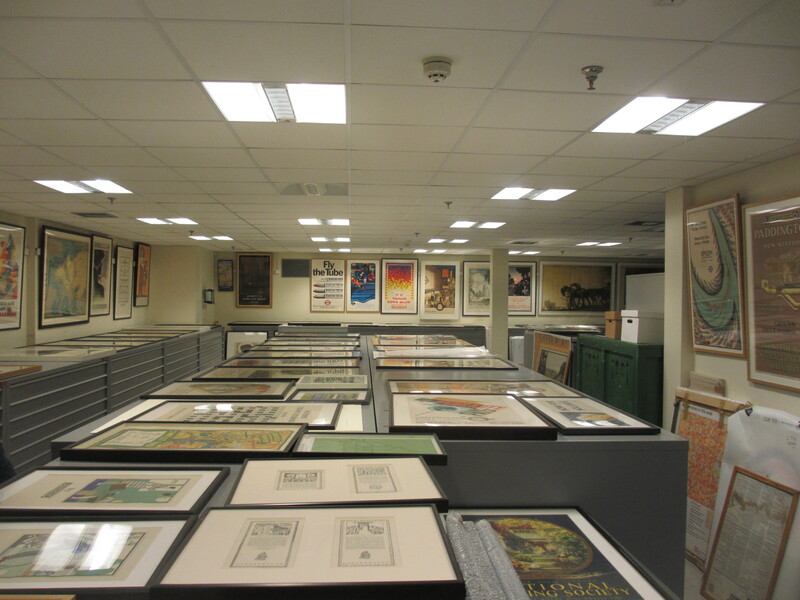 Last year, I went to see the archive collection of posters with a group of fellow guides belonging to the City of Westminster Guide Lecturers Association . There were two rooms, one of which contained the orignal artworks and the other copies of printed posters. It is an extensive collection and was very impressive, as it goes back over 100 years. Plus the volunteers who take you round are very knowledgable. Just across from Museum Way is Acton Town Station. Acton Town seems so important when you are on the tube as it is an interchange between the District and Piccadilly lines, but I have never had cause to get off here or indeed see what it looks like from the road – until now. Acton Town station was originally called Mill Hill Park when it was opened in July 1879 by the Metropolitan District Railway on its extension from Turnham Green to Ealing Broadway. It became a junction in 1883 with the opening of a line to Hounslow. 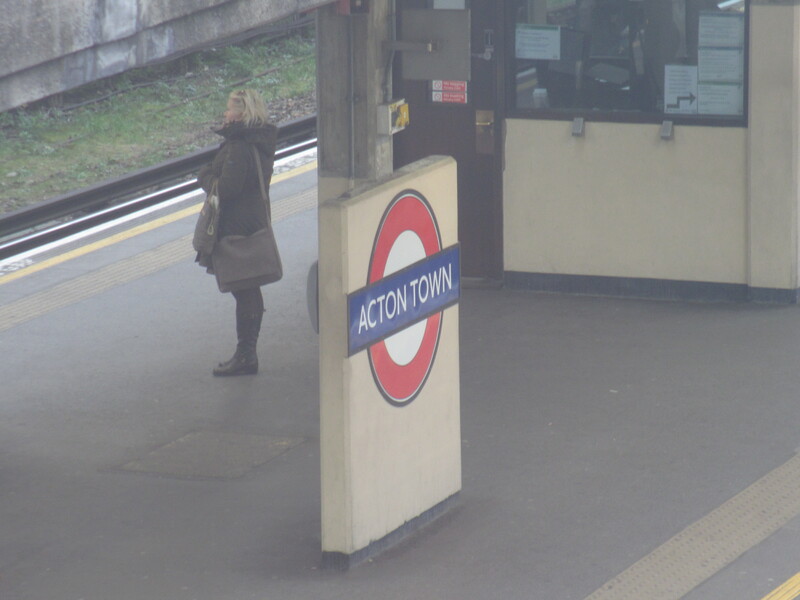 The station was rebuilt in 1910 and at that point it became known as Acton Town. 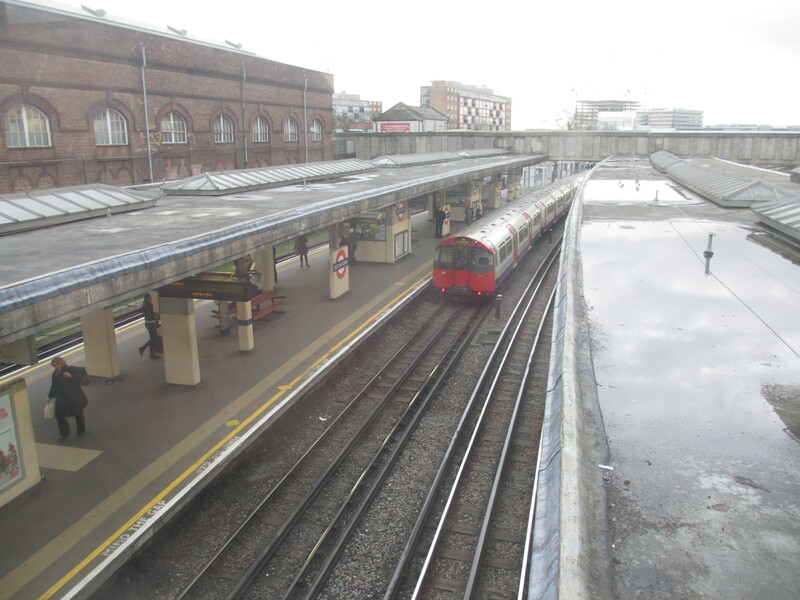 It was rebuilt again when the Piccadilly line was extended west from Hammersmith in 1932. 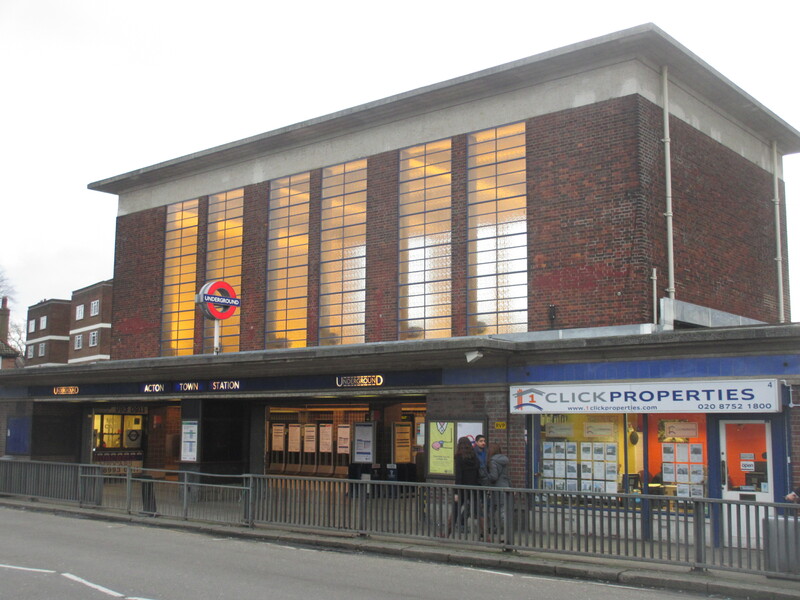 Acton Town is a rather lovely station by the prolific Charles Holden. We saw some of his earlier work in the stations at the southern end of what is now the Northern line when we were in the SW postcodes. Now we see an example from the early 1930s. It has an impressive ticket hall and also has its original concrete platform canopies and waiting rooms. And yet when you come at this station from the street, it comes as a surprise to find this beacon of design in an otherwise dull street. 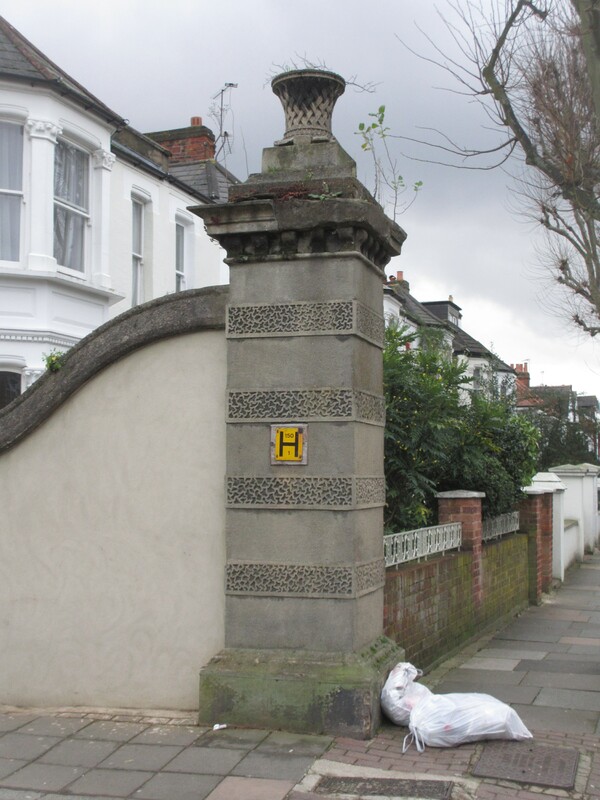 Now retrace your steps back up Gunnersbury Lane and turn right into Avenue Road. 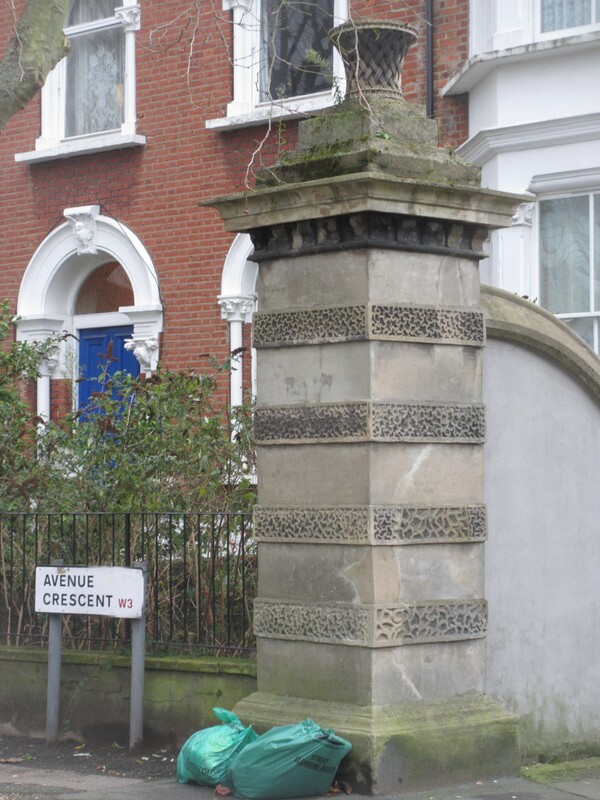 As we walk down Avenue Road note the streets on the right (Avenue Crescent/Avenue Gardens) have rather grand gateposts. These streets were developed by William Willett. He and his son (also William) were prominent house builders in the late 19th century and had their head office in Sloane Street, just south of Sloane Square. Not sure if these gateposts were the entrances to the original estate on this site or whether they were gateways to the new housing development, as that had been built with private roads. Fascinating fact time – again: The younger William Willett was a great proponent of Daylight Saving Time. In 1907 he published a pamphlet “The Waste of Daylight” in which he proposed that the clocks should be advanced by 80 minutes in four incremental steps during April and reversed the same way during September. It was only the advent of the First World War that led to the introduction in 1916 of daylight saving (or British Summer Time as we would call it now) but this of course was much simpler with only one change of a single hour in the spring and autumn. Sadly William Willett did not live to see this as he died in 1915. 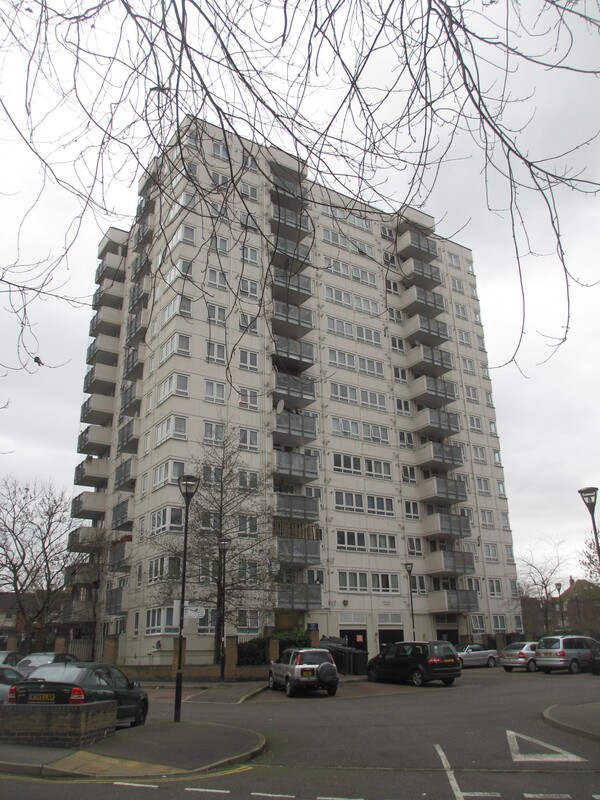 Continue along Avenue Road and the character changes as we get to a large estate of tower blocks. We are heading for Harlech Tower which is the one by the corner of Avenue Road and Park Road East. Now this may look familiar. 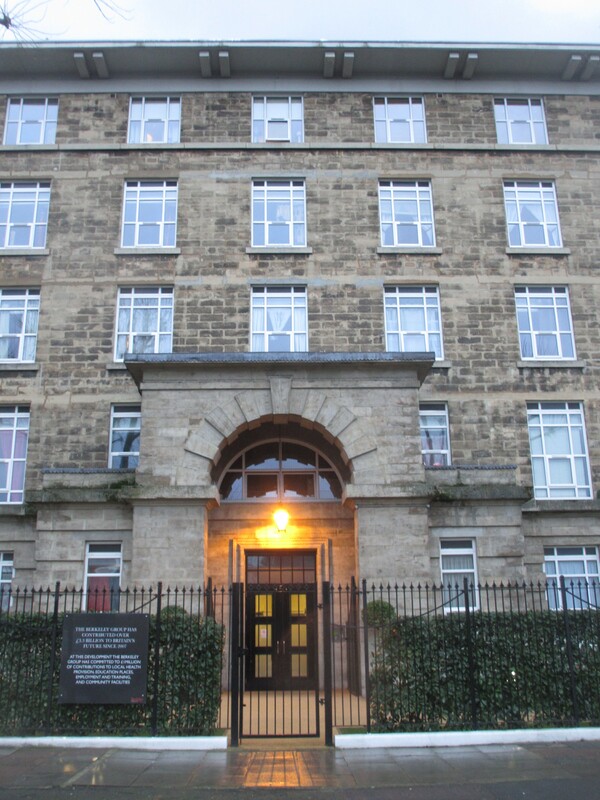 This is because it is the block that was used in the sitcom Only Fools and Horses as the location of Delboy and Rodney Trotter’s flat in Nelson Mandela House. So there is a little bit of W3 which is forever Peckham. I guess this was used as it was easier to get to from the BBC Television Centre than Peckham would have been. However it was only used in series 1 to 5. Later episodes used a tower block in Bristol! Go back to Avenue Road and continue a little way until you get to Church Road where you turn left. Continue to the end of Church Road and you will be back at the High Street. Turn right and a little way along on the other side of the road is our next stop. You can tell how prosperous an area is by the shops in the shopping mall. Here we have the likes of Sports Direct and Iceland, so clearly not much money here. This was the site of the Globe Cinema which opened in March 1921. Within months of opening, the cinema was taken over by the Provincial Cinematograph Theatres chain which itself was taken over by Gaumont in 1929. 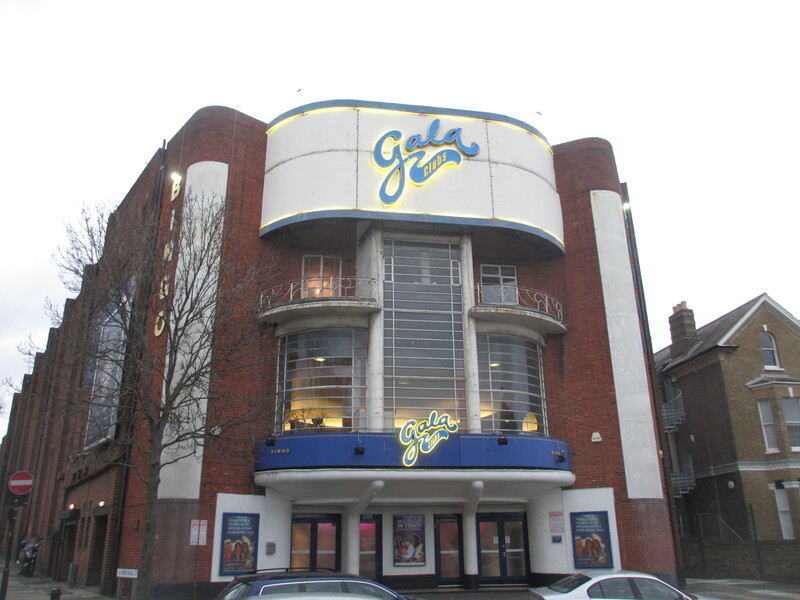 The Globe was re-named Gaumont. It closed as a cinema in April 1959. The building was demolished and the site redeveloped, although the current building dates from sometime after the closure judging by the look of what is here today. 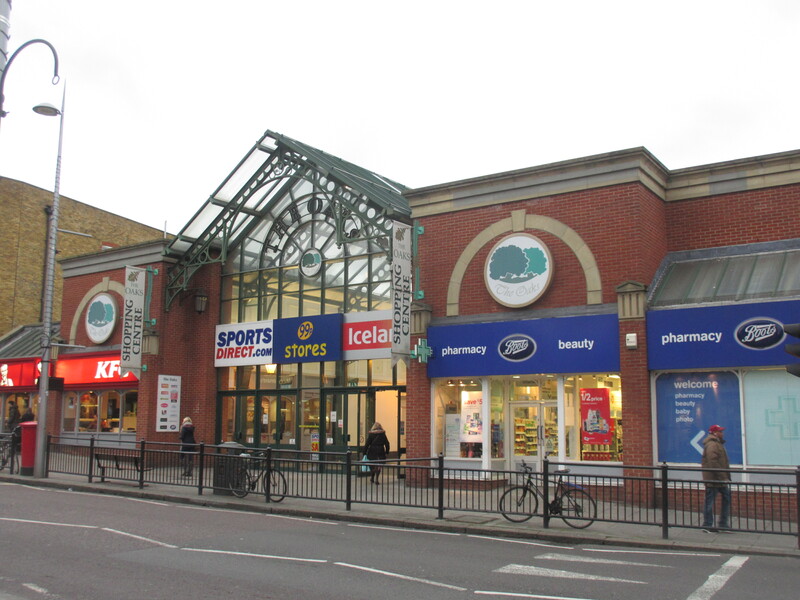 The entrance to the Oaks Shopping Centre is now where the Globe once stood. This is a grand collection of municipal buildings dating from when Acton had its own local government. First you come to the library, dating from 1898/99. 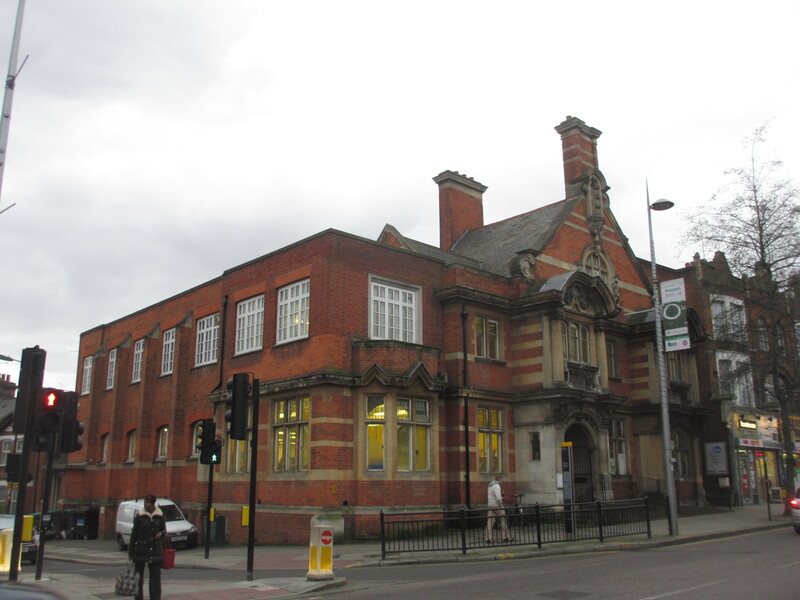 This is a Passmore Edwards library, one of at least 16 in London. John Passmore Edwards was born in 1823 in a small Cornish village, Blackwater, which is between Redruth and Truro in Cornwall. He became a journalist and then editor of a leading London newspaper called the Echo. He was a life-long champion of the working classes and is remembered as being a generous benefactor. In a period of 14 years, over 70 major buildings were established as a direct result of his gifts and donations. These funded not only libraries but also hospitals, schools, convalescent homes and art galleries. He died in 1911. 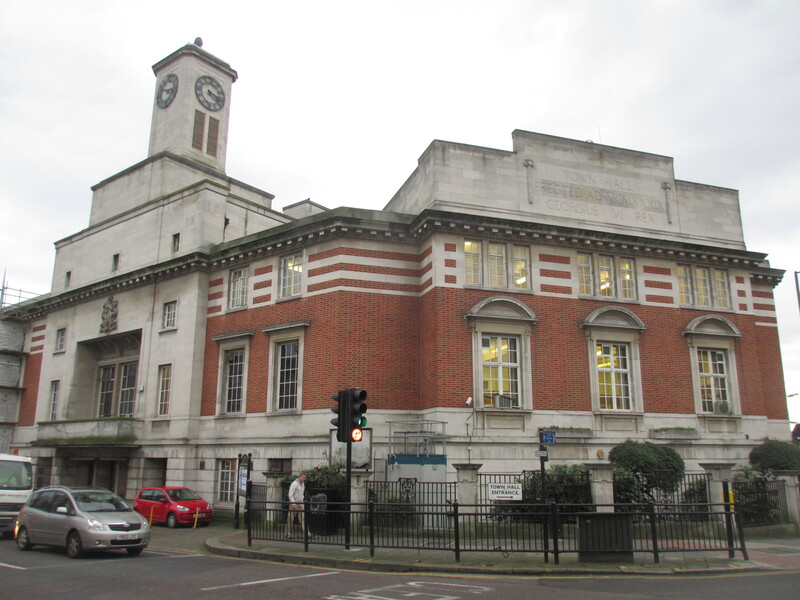 Then across the side road (Winchester Street) is the Town Hall itself which includes a council chamber. Then comes the public baths and swimming pool. The oldest parts are the baths at the far end dating from 1904 and the offices facing Winchester Street dating from around 1910. 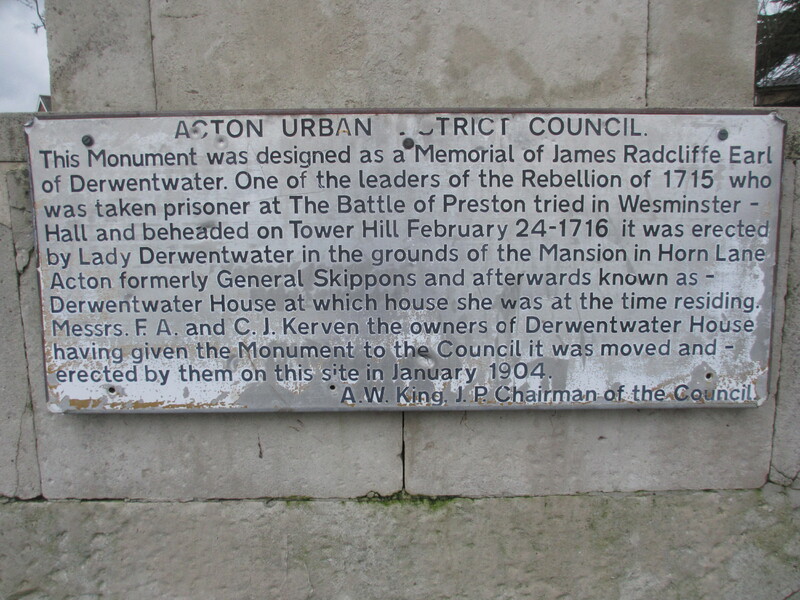 At this time Acton just had an urban district council. It became a borough in 1921. 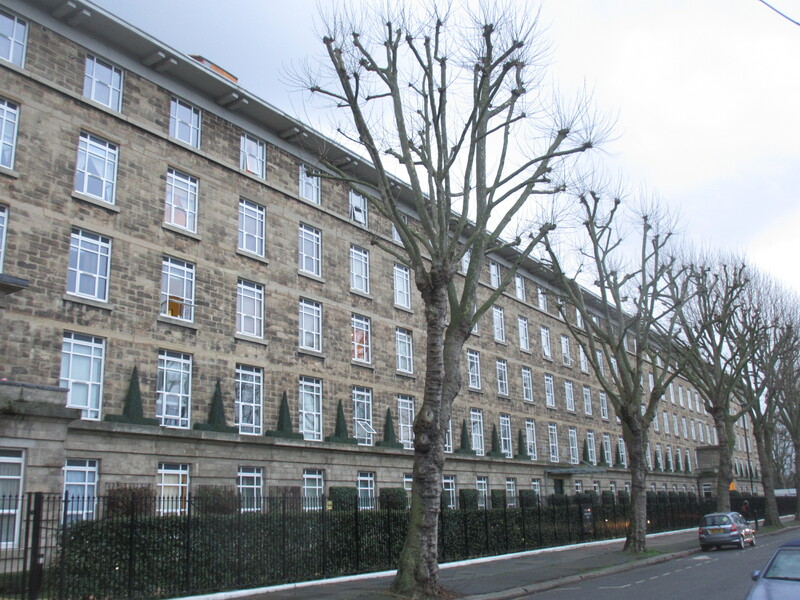 Further additions were made the buildings in the 1920s and 1930s. 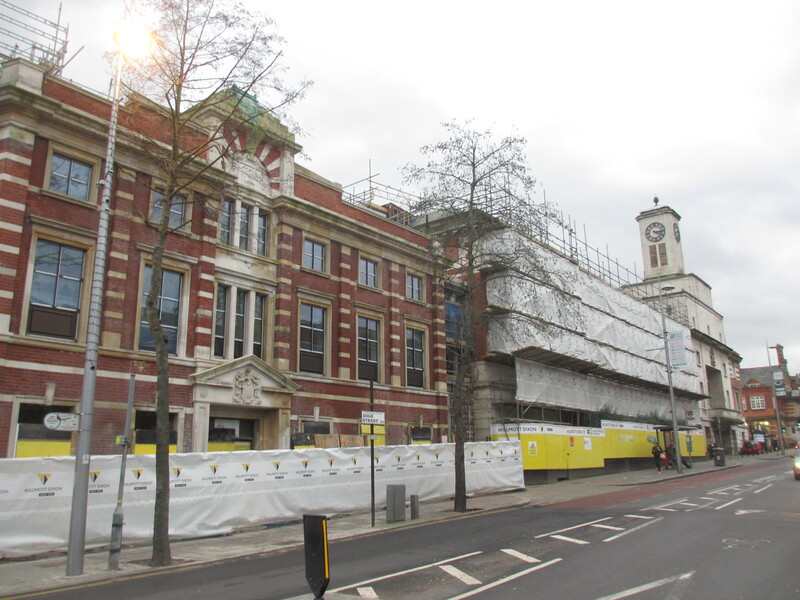 There is currently some redevelopment going on to create a new leisure centre, which is due to open later this year. Note the crest and motto under it. 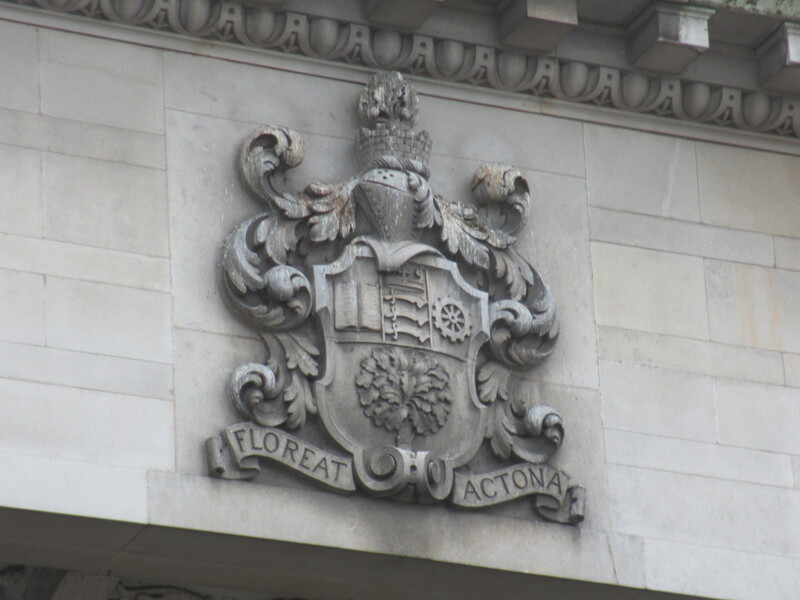 The motto is “Floreat Actona” which means Let Acton Flourish. This echoes the motto of Eton College (“Floreat Etona”). Today this formulation for Acton would suggest delusions of grandeur or perhaps an “in joke”. But I suspect this was chosen in deadly seriousness by the newly formed County Borough of Acton in 1921 as symbolic of where they wanted Acton to go and what they wanted it to be associated with. The oak in the arms and crest references the name Acton as meaning ‘oak town’. 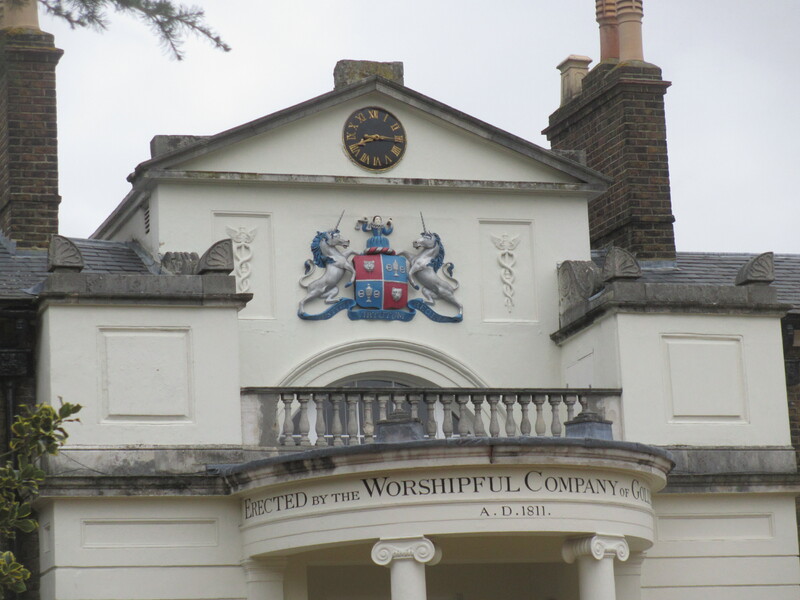 Within the shield, the book (on the left) represents education and the cog-wheel (on the right) the motor industry, whilst the Crown and three swords in the middle are from the Middlesex County crest. 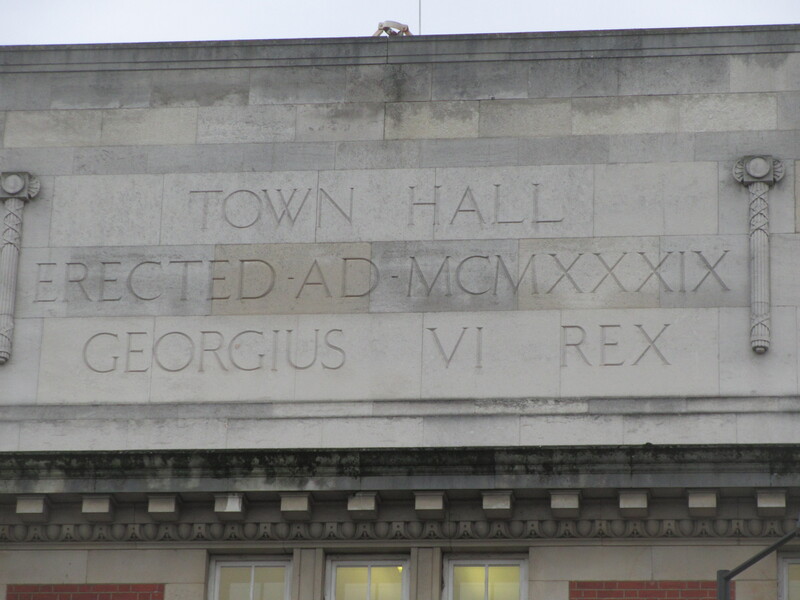 The local government reorganisation of 1965 meant that Acton became part of Ealing. 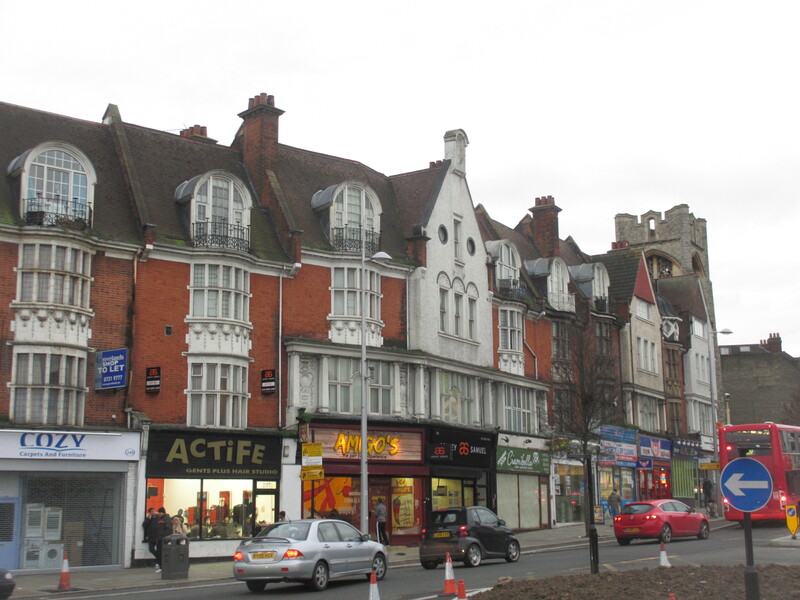 The name Acton disappeared as a borough and the main centre of administration became Ealing. Continue walking along the High Street. Our next stop is on the left a little before we get to the railway bridge. We have seen the sites of two cinemas but here is one that has survived until today, although now a bingo hall. This was the Dominion Cinema which was opened in October 1937 by the small Bacal & Lee Circuit. It has lovely Art Deco style features outside and apparently the auditorium is pure streamline deco with hidden troughs of concealed lighting. The Dominion was taken over by Granada in 1946 and became known by that name. 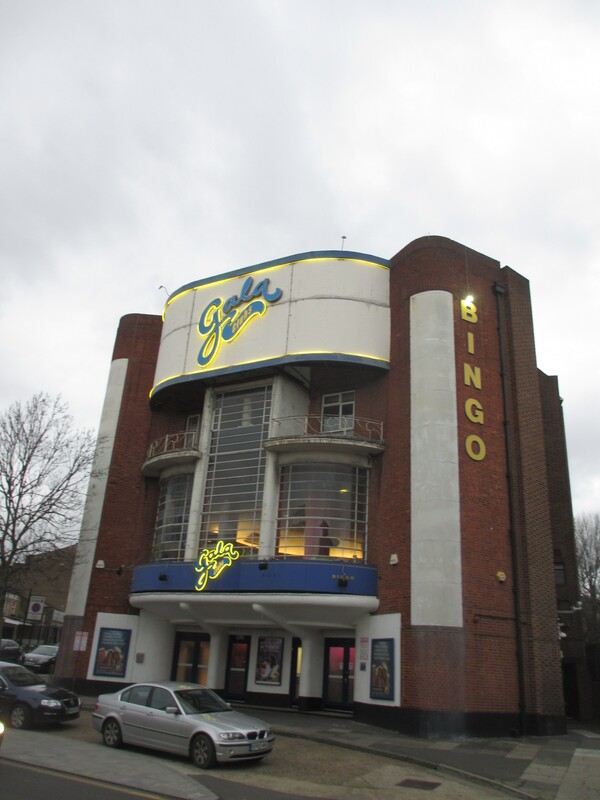 It closed as a cinema in August 1972 and has been a Bingo Hall ever since. It is a Grade II Listed building, so hopefully will survive now in some form. Continue walking along the main road soon after the railway, there is a gate into Acton Park on the left. Go in there and head towards the little chalet building. 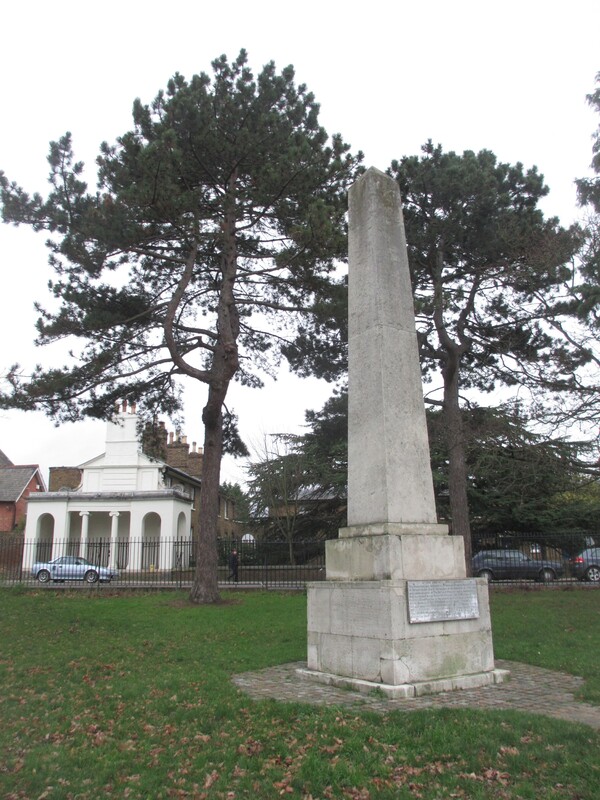 Acton Park was laid out in 1888 after the local board (predecessor of the council) bought the land mostly from the Goldsmiths’ Company who had been left this by one of their number, a man called John Perryn. The Goldsmiths’ Company had grand plans for an estate of large houses. However after only building a few houses, the plan was dropped and they sold the site. Take the path with the tea room on your left and as we head out of Acton Park, on the left is an obelisk and below a slightly weathered board which explains the story – well possibly. This is allegedly a memorial to James Radcliffe, Earl of Dewentwater (apparently pronounced “Darwentwater”) executed for treason in 1716. He was one of the leaders of what the board describes as “the Rebellion” which of course was the Jacobite rebellion. The family estates were in Northumberland and were confiscated. The connection to Acton appears to be that his widow leased a house in Horn Lane in 1720 which then became known as Derwentwater House. Now leave the park and go into East Churchfield Road. 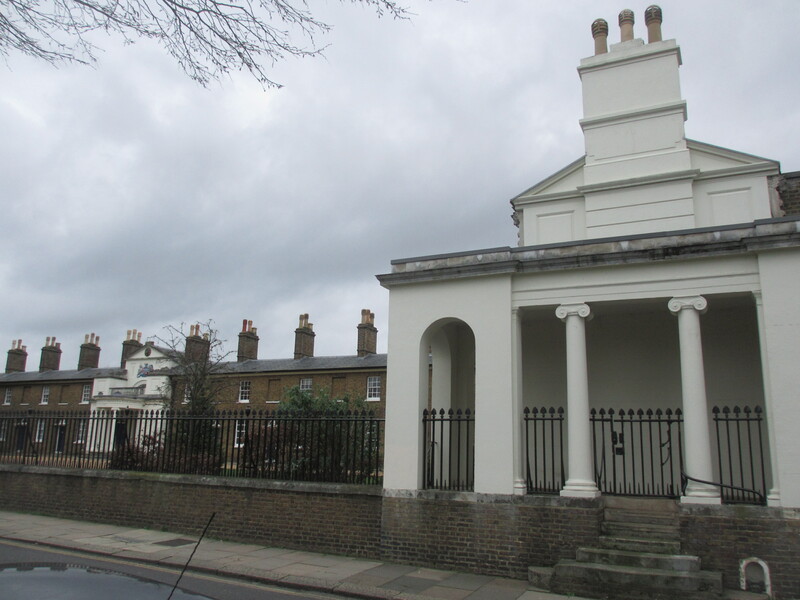 Across East Churchfield Road from the park you can hardly fail to miss the Goldsmiths Almshouses. 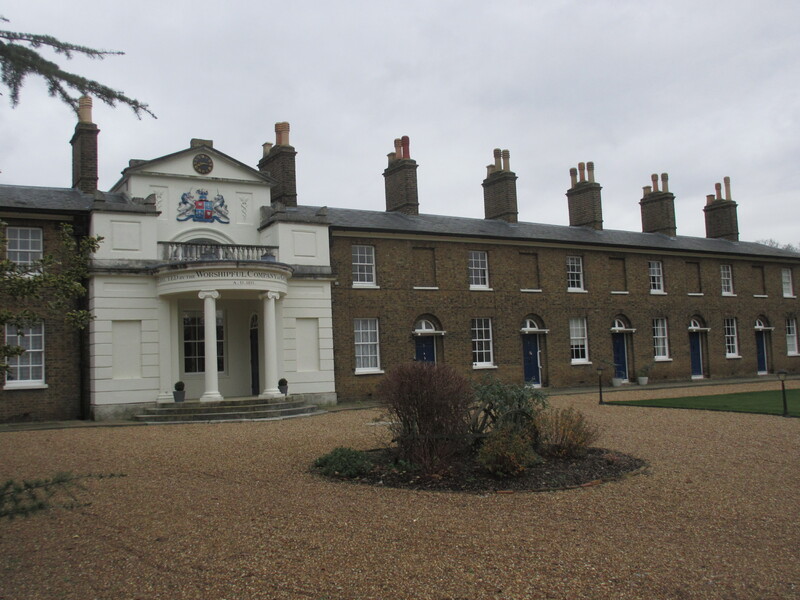 There were originally twelve Almshouses built in 1811 with a further eight added in 1838. These are quite delightful but sadly we have to view them from afar as one cannot get past the railings. 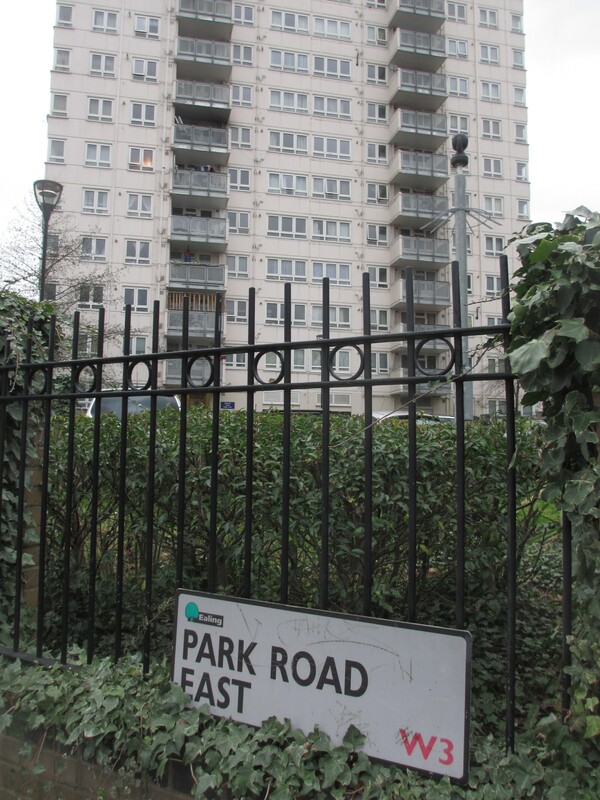 Now follow the park round to the end of East Churchfield Road and turn right into East Acton Lane. Go to the end of East Acton Lane and turn left into The Vale. Continue along The Vale until you get to a half moon shaped green on the left. this is where Bromyard Avenue meets The Vale. 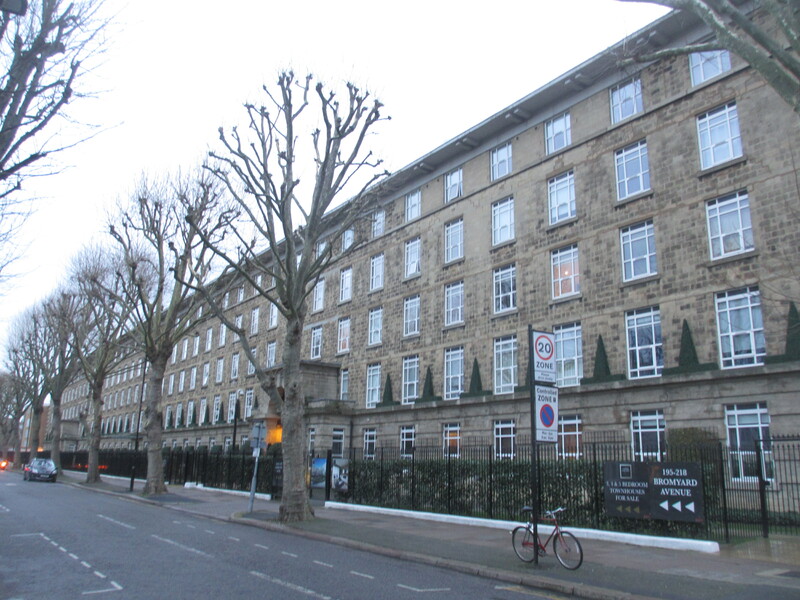 As you look down Bromyard Avenue, you will see stretching ahead of you on the right hand side of the road a substantial 5 story building. 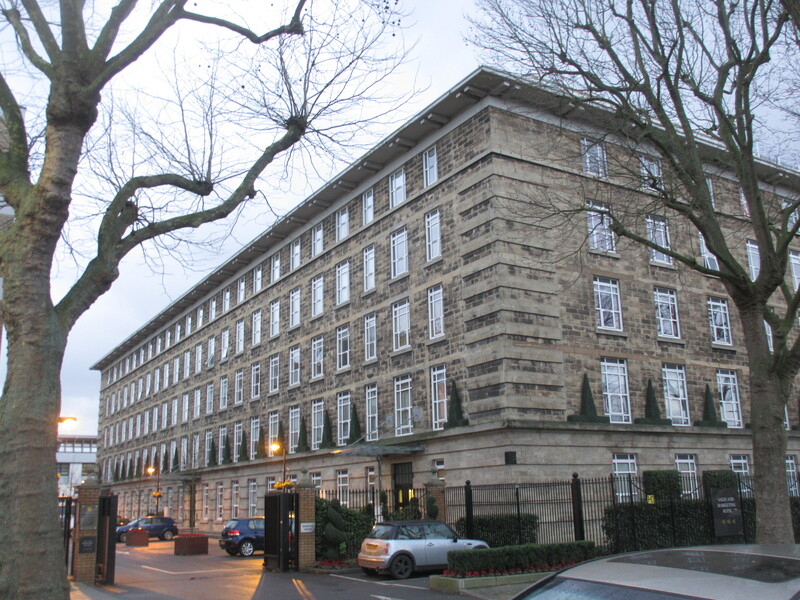 This was purpose built for the Ministry of Pensions – started in 1914 and only finished after the war in 1922. It is impressive – a kind of Georgian terrace on steroids. And perhaps even it has the look and feel of Edinburgh. Today this building has been converted into apartments. So that brings us to the end of the W3 walk. W3 held a few surprises such as being the home of the first Waitrose as well as the real “location” of Rodney and Delboy’s flat and an 18th century memorial which may just have been garden ornament!